Abstract: Already in 2013, we have talked about the future trend in the website and predicted there would be changes in the market from 2014 to 2015. Recently, the price of raw materials of used clothes all around the country decreased sharply, which is the most serious in Guangdong regions. Already in 2013, we have talked about the future trend in the website and predicted there would be changes in the market from 2014 to 2015. Recently, the price of raw materials of used clothes all around the country decreased sharply, which is the most serious in Guangdong regions. 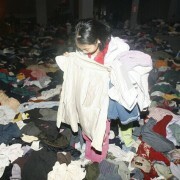 The price of used summer clothes dropped from 6000 RMB per ton to 5200 RMB per ton. The price of used bags dropped from 5300 RMB per ton to 4600 RMB per ton and the price of used shoes dropped from 4800 RMB per ton to 4200 RMB per ton. Why did the prices decrease so sharply? 1. The market was growing too fast, as a result, the supply was over the demand. What’s more, the number of employees increased, which resulted in bigger competitiveness and burdened the original profits of the market. From the point of orders, with the increase of supply level, the general demand for orders improved, which increased the price and cost of the factory indirectly. 2. The price of crude oil kept rising which resulted in the global financial depression. As a result, Euro-rate decreased seriously and it was hard to exchange US dollars. The suppliers had not enough cash for trade. 3. The local economic policy in America was adjusted. America hoped to take back dollar cash under the situation and to bring in the overseas enterprises to make the dollar cash in foreign markets harder to get. It’s predicted that the dollar cash will continue to be scarce. How can the employees response to the situation? 1. Unify the industry. Cooperate with the circumjacent enterprises in the same industry and discuss about solutions. Take control of the used-clothes market and make sure of the profit. 2. Cut down the inventory. In the coming days, we believe the raw material market will keep going down, especially in northern regions where responses show slowly. (The price has dropped 500 to 800 tons in southern regions.) A large quantity of inventory will directly result in economic loss. In the coming days, we believe the raw material market will keep going down and the orders of the factory will decrease, however, the demand of the global used-clothes market will still be optimistic and active. After some time, the dollar cash will get more plenty and the quantity of orders will get quite large. Although under this circumstance, we suppose the possibility of the rise in price of the raw material market won’t be high. The employees crowding in the market in 2013 made the price of used-clothes and used-shoes market rise. After the dollar cash get more plenty, the market will become more rational and tend to be stable.